We make quality custom challenge coins! Custom Coins Made to Order! Custom coins by their very existence are truly personalized coins. Come on, you get to create your own customized coins, that’s exciting stuff! Your logo, design, type, desired size, shape and plating options. You can even add paint color, either regular enamel paint color or special paints such as transparent paint, pearlescent paint, or heat changing paint. 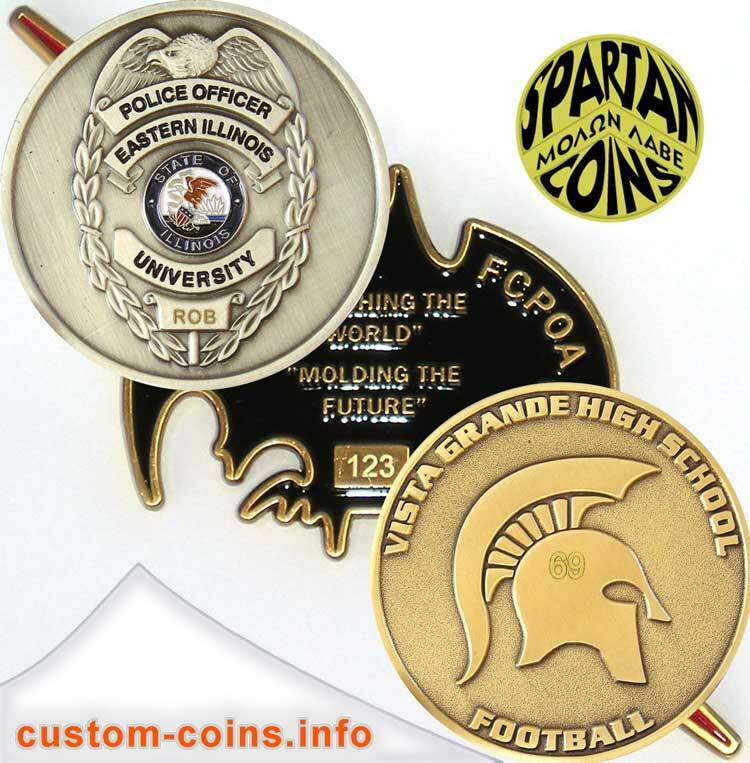 Here at custom-coins.info, we want to be thought of as an authority when it comes to the design and creation of every kind of personalized custom coin. That being said, there are specific topics I feel obligated to discuss on this page. Sequential numbering or unique identifier text can be added to your custom coin order to further personalize your coins. This feature comes in really handy when creating coins for groups such Fraternal Order of Police, Masonic, Moose, Elks lodges, Police and Law Enforcement agencies and bureaus, or special Military Task Force. Why do custom coin companies require minimum order quantities? Minimum order requirements are necessary to make coins affordable! The reality is that you’re probably less likely to buy one coin for $300, than you are to buy 50 coins for $500. These are just arbitrary dollar amounts used to create this example. Creating one coin isn’t just a problem for a challenge coin manufacturer, it could potentially end up being a problem for the customer as well. My reasoning is simple. I have experienced customers ordering a small quantity of coins just to turn around and have to reorder coins because they didn’t realize the demand their coin was going create. Wedding coins are a great example of this. We recently produced an order for 10 coins, exclusively for a wedding party. My natural inclination was to insure this customer only wanted 10 coins, because I know that more people will see the coin and want one. We’re talking about a treasured keepsake here, or another term I use often is legacy coin. People love custom coins but human beings usually doubt their own creativity and can’t imagine how popular their coin will be. Creativity is just anything else, it must be exercised. I’m not really fond of the word cheap when it refers to custom coins. It’s just a term I know, but it’s a term that conjures up images of poor quality products that I would not want to give away or have associated with my business. 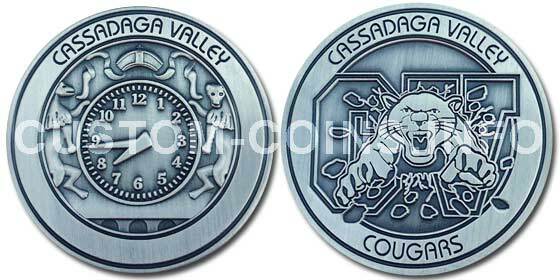 I think every custom coin company has the desire to make a quality, cost effective product. As a business owner you’re kind of stuck between a rock and a hard place. You need to keep your business profitable while keeping your prices low enough to be competitive. 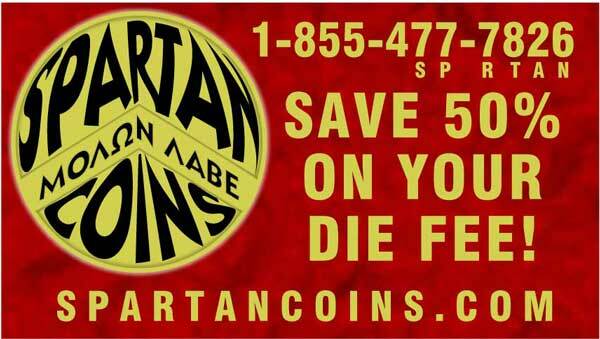 To this end most credible custom coin makers offer a price match guarantee. There's never a better time than right now to find out what’s best for your design, or how much your custom coin order will cost. The easiest way to find out is by completing our secure online quote request form. Our artwork service is always FREE!. The images and written content of this website belong soley to their author Robert D. Blackburn and may not be copied under any circumstances.